We’d love your help. 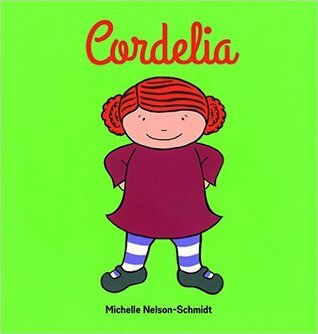 Let us know what’s wrong with this preview of Cordelia by Michelle Nelson-Schmidt. To ask other readers questions about Cordelia, please sign up. This was a really adorable little book. I had a library patron recently recommend this to me. I found this book very sweet and I loved the positive messages that it gave. Cordelia is a little girl with a big imagination who believes she can fly and she tells others that she flies to all these magnificent places, but they don't believe her or care. Cordelia then becomes upset, because she is called "silly" and is put down for her big imagination. She then questioned "Is who you are dependent on w This was a really adorable little book. I had a library patron recently recommend this to me. I found this book very sweet and I loved the positive messages that it gave. She then questioned "Is who you are dependent on what other people think?" I think this is an important question for children AND especially adolescents because so often it is easy to worry about what others think of us. But when Cordelia stops pretending to fly, that's when it changes her into an angry person and she is no longer, happy and excited. Then Cordelia realized that she liked being the way she was. The overall message here teaches kids to be themselves and be proud of it and that is a very important message in a world where it is so easy to be judged by peers or on social media. This book is about a little girl that can fly and when those around her don't believe that she can fly or even listen to how she flies, she losses her ability to fly. Once she decided not to let those that don't believe her hurt her, she starts to regain her ability and starts to fly again. This is a great book about self esteem and a reminder to just be you. This could be a picture book for young children who are afraid of being who they really are. I would use this book during reading or language to teach kindergarten-3rd graders about theme or just being yourself and not caring what others think about you or want you to do. This book can be utilized in many ways throughout various grades. The message of being your true self will resonate with students in the second and third grades as well as students in fifth and sixth grades. Love, love, love this. It's about a girl who lets the critisms and negativity of society bring her down, before she remembers that SHE believes she can do it. Definitely a message I want my kids to always remember. Cordelia can fly and the more she believes in herself, the higher she can go. But then other people start to tell her she's wrong. She cannot fly. And she believes them and starts walking like everyone else. But her world gets gray and she misses the sky. She decides not to care what others think, and she can fly once more.